Congratulations to all involved in fielding our 4 Senior and 6 Junior sides during the 2017 season and many thanks to our wonderful sponsors. A great effort by all culminating in the 4 teams who will proudly represent the Gold & Blue this Saturday. Final open training session. U 17 5:50 to 6:30 and S/L,Div1 & Div2 6:30 to 7:30. Come down to the club and watch the teams as they prepare for Saturday's Grand FInals. Can I ask that all club equipment be returned for a stock take. Let us know if you wish to hang on the stick over summer. We have some gloves for the younger kids available for sale. Saturday 16th September - Game Day. Show your support for all our teams by coming to the GFs dressed in Club Gear so there is a sea of Blue & Gold at the games. Good Luck to all. After the games come back to the club for the usual post game deliberations. 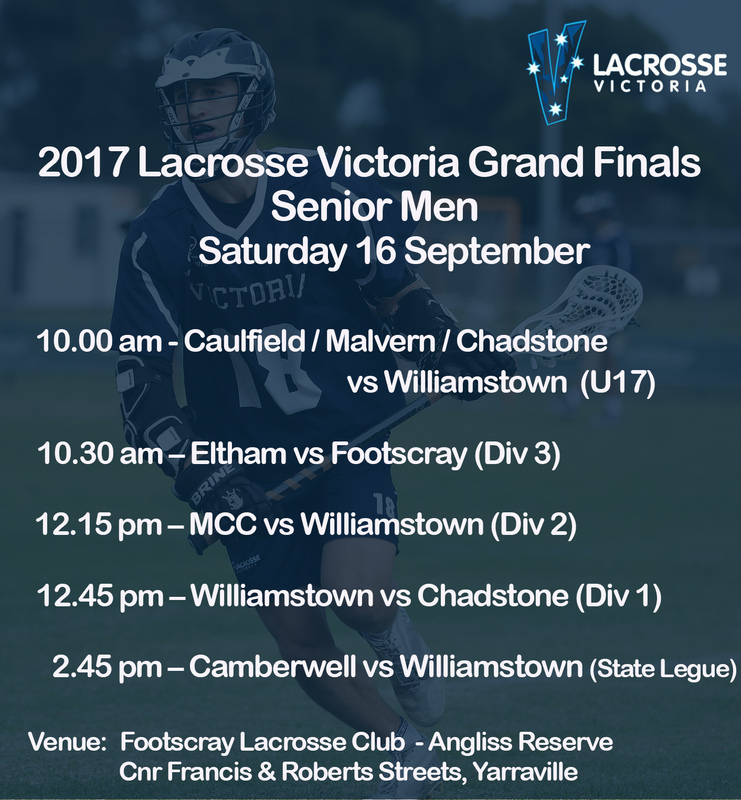 Starting at 12 noon we invite all members of the Williamstown Lacrosse Club community to celebrate the 2017 season. Beer, Wine, Soft drinks and Spit Roast Lunch will be supplied. This day is sponsored by the club & members of our community to thank those that have contributed to the club during the year. Free Entry to all players, sponsors, Team Officials, 2017 100 Club members, Contributors to the day (salads/sweets/donations). Senior player's B & F vote counts will start with Div 3 at approx. 12:30 PM followed by coaches awards for each team. Mal Taylor Award for Best Club Person and Darren Gibson MVP S/L player (voted on by the players) will follow the S/L awards. This is a fantastic day to end the season so hope to see you all at some stage during the day. Monday 18th September - Player's Mad Monday @ various Williamstown venues. Tuesday 5th December, 7:30 PM @ The Club. Please consider being a part of this great club by offering your services on the general committee or other sub-committees.